As mentioned in a previous post, the ravine that served as inspiration for Herne's forest has two major differences from its fictional counterpart. For one thing, it's half gone; for another, it's missing Herne's tree. However, the model for his legendary home is less than half an hour away, on the grounds of Hampton University: the Emancipation Oak. Named one of the Ten Great Trees of the World by the National Geographic Society, the tree is one of many live oaks in the South. (For those curious about the name -- the "live" part of "live oak" refers to its evergreen nature, keeping its foliage even in the winter. For the sake of prettiness we'll red and orange up Herne's tree, but we already know he likes to redecorate even if it doesn't match the workings of nature! Under this tree in 1861, schoolteacher Mary Peake held lessons for newly freed slaves. A school was eventually built nearby. And in 1863, the tree was the site of the first Southern reading of the Emancipation Proclamation -- hence the tree's name. 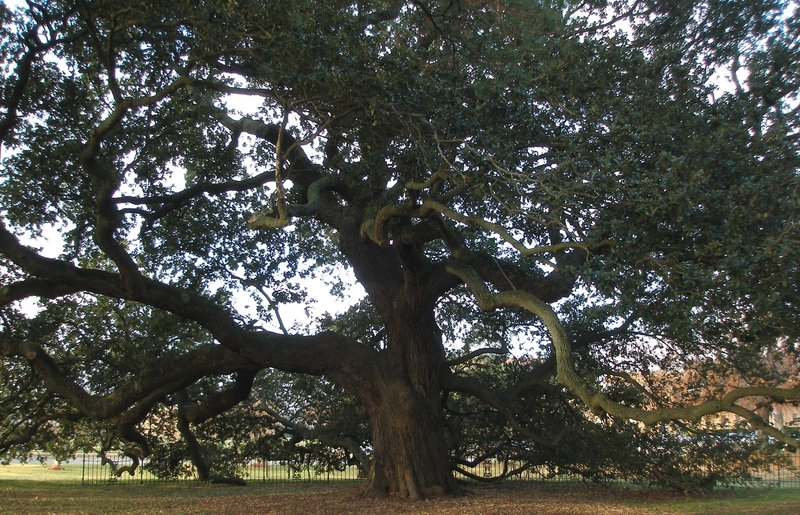 There's lots more information about Mary Peake, the school, and the history of the Emancipation Oak over on the Hampton University website. Be sure to check it out! The main notable difference between the Emancipation Oak and Herne's tree, at least visually speaking, is the span of the branches. While live oaks like this one will tend to have a couple branches that would dip close enough to the ground for climbing, we thought it best to give Herne his privacy. A little awkward for Iris, but helpful for a nature deity who wants to be left alone. We're looking forward to offering more glimpses into our books as we go. Is there anything in particular you're curious about the background of? Hit us up on Twitter!